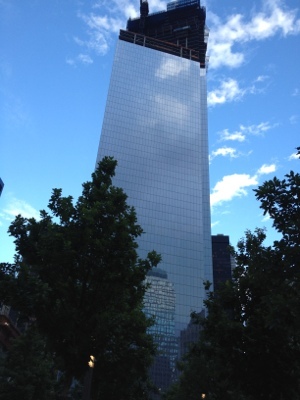 “We are going to the 9/11 Memorial to pay our respect to the city, the victims and their families before we visit the rest of city,” I told our 11 year old granddaughter, Kaily, earlier this month. Our hotel was near Time Square. We walked to the subway. So many people!! We held hands…hung on for dear life is more like it! Not sure which way to go once we left the subway, I asked a businessman sitting across from us. Kindly he showed us the correct stairway. When I told him why we were first visiting the memorial before the rest of the city, he was greatly appreciative…you see he was in one of the Towers in 2001 and during the 1993 bombing. Details were not shared…we respected his silence. Changing subjects, he showed us the new towers under construction, pointed us in the right direction and we parted ways. It was just before dusk when we arrived. Walking into the area we were able to get a better look at the new buildings whose shadows fell upon the landscape where those fated buildings once stood 11 years ago. Reverently we stood there. 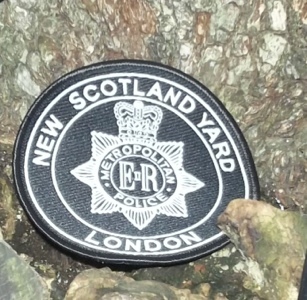 Name after name, grouped together with those they worked with that also lost their lives; Police Officers, Firemen, Rescue Workers, Consultants, Visitors, Employees…the names seemed endless. 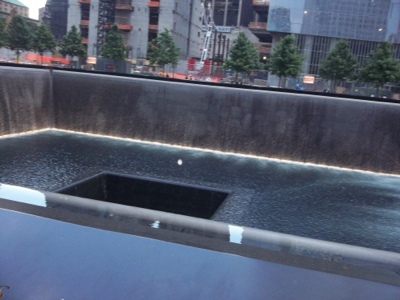 We walked from the South Tower’s reflection pool to the North Tower’s. Lining the edge of the acreage I noted a bank of computers where one could look-up a loved one to learn where their name was inscribed. Kaily wanted to select a name from the North Pool and then enter the name into one of the computers. As she walked to the pool, I prayed that the name would have significance to her. I did not want this to be just an exercise, but for God to be in the midst of this. We were on Holy Ground. I told her we’d pray for the family and friends of the person she selected. She walked to the north-west corner…Steve Morris was the name she selected. We prayed for him as we walked to the collection of computers. After entering his name into one of the computers, the face of a young man with dark hair appeared. He was 31 years old when he died; born in Chester, England (United Kingdom). He was a resident of Ormond Beach, Florida. Ormond Beach! The town just north of where Kaily was born and I live. Ormond Beach! The town I worked in for 18 years. Ormond Beach! A place Kaily knew…a place she could relate…no longer was this just a list of names…the reality of this horror set in. 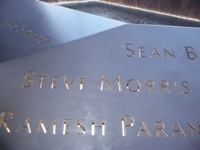 We looked-up dozens of names that surrounded the inscription “Steve Morris” expecting to find additional names from Florida. They were from New York, New Jersey, Canada, United Kingdom…you name it…but no one from Florida. Neither one of us will ever forget this young man and his family and friends. I was in Tampa on 911 and watched on TV as the second plane crashed into the South Tower; however, Kaily was an infant. God provided a way for her to connect to this tragedy and to be a part of those who hold this dear young man in their heart. To the family of Steve Morris, we express our deepest sympathy and want you to know you are in our prayers. I read online that a memorial bench was placed in a park near Ormond Beach by the Intracoastal Waterway. It would be such an honor to know where this bench was located. I would like to take my granddaughter there and once again honor him. To NYC…my heart goes out to you. 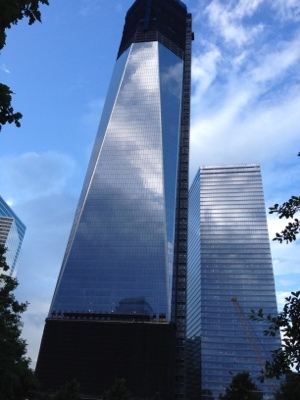 I have visited NYC several times since 911 and it is good to see you healing. 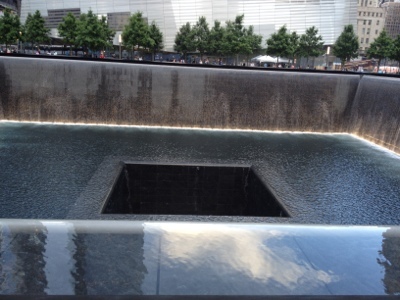 The Memorial is…truthfully I am at a loss of words…so many emotions arose when I saw those pools…the vast void…I cannot describe it. May we never see such terror reign on the American soil again…and may the rest of our world find peace. Baby Claire ~ critical open heart surgery and in intensive care for months is HOME with her family. Friend ~ hospitalized with collapsed lung and pneumonia…improving!! 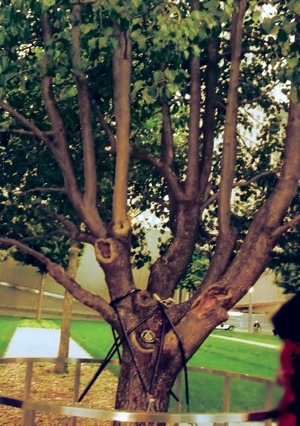 9/11 Survivor Tree was found amongst the rubble…charred and mangled by the attack it now stands tall. A symbol of The City’s strength.